A Cairo criminal court sentenced Mohamed Badie, the Muslim Brotherhood's supreme guide, and 13 other leading members of the group to death on Monday for inciting murder in the now infamous case known in the media as "Rabaa control room." 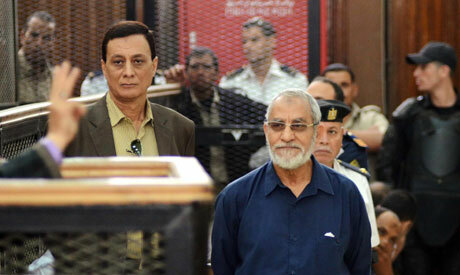 The court has referred the death sentences to Egypt's Grand Mufti for revision. The referral of the sentences to the Mufti is the first step in the legal process required to enact a death sentence. The Mufti's decision is not binding. However, following his decision the court will issue a final verdict. Once a final verdict is issued, defendants can appeal. Badie and another 13 Brotherhood figures are convicted of setting up an operation after the violent dispersal of the Rabaa Al-Adaweya protest camp in mid-August in 2013 to direct the movements of Brotherhood supporters across the country as part of plans to defy the state and spread chaos, as well as plot attacks on police stations, private property and churches. Badie is currently standing several trials in relation to violent acts committed by supporters of ousted Islamist president Mohamed Morsi, who hails from the Brotherhood, following the police's dispersal of two pro-Morsi sit-ins in August 2013. He was sentenced to death before in other cases, but the sentences were later reduced to life imprisonment. Meanwhile, a Mansoura criminal court sentenced eight members of the Muslim Brotherhood to death in two different cases also on Monday. The defendants were accused of attempted murder, possessing weapons and destroying public property, as well as receiving military training in Gaza. The court has referred the death sentences to Egypt's Grand Mufti for revision. It will announce the final verdict in the first case on 18 May, and the final verdict in the second case on 22 June. The Egyptian government designated the Muslim Brotherhood a terrorist organisation in November 2013. Hundreds of its members have been sentenced to death over the past year and a half. Get the job done, their multitude of victims have been dead long ago. By the way, how much do you get from the thuggisdh regime for your heckling?